At Johnston, we make a promise to provide our customers with information and access to the latest and greatest industry innovations. Expanding our lines with great vendor companies like Inline Plastics is one way we make good on that commitment. For more than 45 years Inline Plastics has been innovating, growing and bringing to market the best in crystal clear 100% recyclable PET packaging. 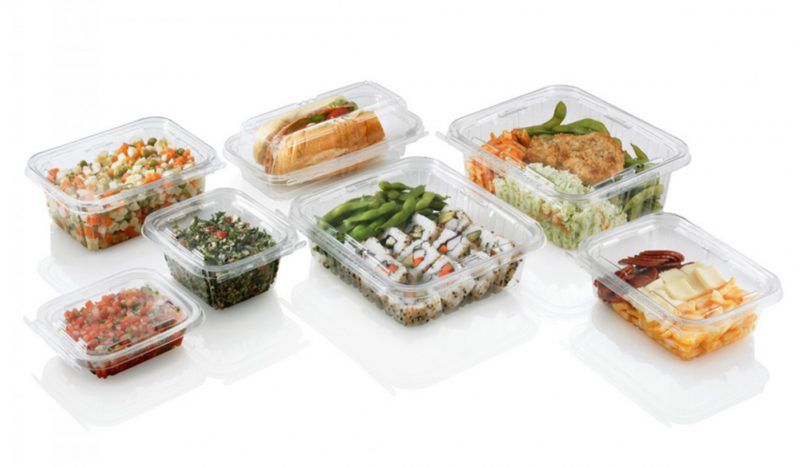 Inline Plastics packaging is designed to attractively merchandise products from produce, deli, bakery, grocery convenience store and food service industries. They specialize in solving problems related in these industries like improving shelf life of products and ensuring safety with tamper evident containers. Although their packaging is crystal clear, it’s plenty green as well. As a company they are committed to the environment as well as quality. Below you see a small selection of the numerous product liens offered by Inline Plastics including links to more information about each specific line. This extensive Safe-T-Fresh line utilizes a patented Safe-T-Gard tamper-resistant locking mechanism and perimeter seal to lock in freshness and extend the life of grab and go products. The innovators at Inline Plastics have adapted this line for many uses such as Hangables, Bowls, Snack Cups, Vented, PagodaWare, SquareWare, RoundWare and more. The Crystal Fresh seal design combined with advanced moisture control of PET allows soft food to stay softer and crisp to stay crispier, longer! The Visibly Fresh perimeter seal design increases shelf life up to 33%. The extensive bakery selection of inline fall under 3 main lines: EZ Open, Crystal Vue & SureLock. Johnston works with leading vendors to offer sustainable food service products to suit our customers needs. Our dedicated specialists can help you identify the products and processes that are most suitable to your unique situation. Contact a Johnston expert today to set up a time to meet and discuss your wants and needs. Visit our contact page today!